Throughout his professional and personal life, Ryan has shown a commitment to service and an ability to lead – be it for our country, our citizens, or our local community. After two productive terms in the state House of Representatives, the people of northern Lancaster County elected Ryan in 2014 to serve them in the Pennsylvania Senate. Since then, Ryan has continued to work as he has throughout his legislative career: as a strong advocate for government transparency, accountability and reform. 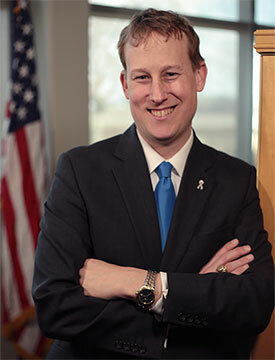 Today, he serves as Chairman of the Senate Communications and Technology Committee, which is responsible for reviewing legislation and policies intended to help state government keep pace with the rapid pace of technological innovation, including measures to utilize new technologies to reduce government operational costs. Ryan also supports a transformation of legislative benefits to reflect those available in the private sector, and leads by example by contributing to his health insurance and refusing a taxpayer-funded car. As a state Representative, Ryan played a leadership role in developing a comprehensive statewide educator evaluation system. Working closely with teachers, administrators, school districts, and other education experts, Ryan helped to establish a legislative framework for a system that offers educators accurate and constructive feedback on their job performance. Before his election to the state House, Ryan served as the Lancaster County Clerk of Courts, where he was responsible for maintaining criminal court records. He also served as the chief of staff for Rep. Bryan Cutler, and gained valuable experience working with a legislative body as a member of the Quarryville Borough Council. Ryan served as a captain in the United States Army during Operation Iraqi Freedom, briefly commanding an infantry company of 150 soldiers after his company commander was wounded in action. He also served on battalion staff as a civil affairs officer. During his military career, Ryan earned several awards, including the Bronze Star Medal, Army Commendation Medal, Army Achievement Medal and Army Parachutist Badge. After returning from Iraq, he applied the skills he learned in leading a unit as a shift manager and production supervisor for ICI Paints. He is a graduate of The Citadel military college in South Carolina. A lifelong resident of Lancaster County, Ryan grew up on a dairy farm, graducated from Solanco High School, and then earned a B.S. in Education fro the prestigious Military College of South Carolina (The Citadel). Today, Ryan resides in Landisville with his wife, Kate, and their children, John David and June. He is a member of the Mountville VFW Post No. 8757, the Lancaster County Children and Youth Agency Advisory Board, the Lancaster County Career & Technology Center Foundation, and Grace Church at Willow Valley, where he serves as an adult ministry team leader.